Home > Educational Materials > Chemistry Educational Materials > Applied Chemistry Learning Activities > Ward's® AP Chemistry Investigation 16: Buffering: How do the Components Change the Buffering Ability? Ward's® AP Chemistry Investigation 16: Buffering: How do the Components Change the Buffering Ability? In this lab, students will explore how components in a buffer solution affect the solution's buffering capacity. Students will prepare a number of different buffer solutions, and will determine the response of these buffers as acids and bases are added. The pH of these stressed buffers will then be compared with the calculated values from the Henderson-Hasselbalch equation. From the buffer solutions prepared, a buffer system will be proposed in order to address a specific pH buffering microbiology problem. Includes acetic acid, ammonia, sodium acetate, ammonium chloride, sodium hydroxide, hydrochloric acid, sodium dihydrogen phosphate, and sodium hydrogen phosphate. 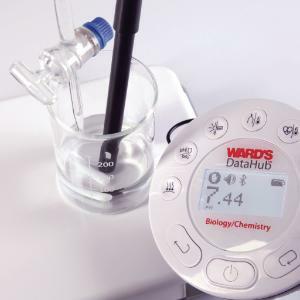 Requires pH meter, magnetic stirrer, magnetic stir rod, analytical balance, burette, and ring stand/clamps, available separately. Ward's® DataHub not required to complete activity. AP and Advanced Placement Programs are registered trademarks of the College Entrance Examination Board, which was not involved in the production of and does not endorse these products. Required but Not Provided: Beakers, Stirring Rods/Magnetic Stirrer, pH Meter, Analytical Balance, DI Water, Graduated Cylinders, Burettes/Clamps, Ring Stands, Volumetric Flasks, Alka Seltzer (optional), pH paper (optional), Gloves, Safety Goggles, Lab Aprons.